Jeffreys Bay, or J-Bay as it is affectionately known, is sandwiched between the scenic Garden Route and Sunshine Coast, on South Africa’s southern coast east of Cape Town. The bay is home to the famous Supertubes, venue of the ASP Billabong Pro, and the legendary breaks where the iconic “Endless Summer” was filmed. Enjoying a stunning location perched on a dune overlooking the Indian Ocean, the Surf house offers dorm and private en-suite accommodation, an outdoor restaurant and a full licensed bar, all with a truly laid back, surfing atmosphere. There is also an opportunity to choose the executive beachfront accommodation. The luxury penthouse (4 people max.) is also used for the WSL Billabong Pro JBay, when pro surfers come to compete in JBay. The Surfcamp is open to all levels of surfing, from complete beginners who will take daily classes on the beach in front of the Surfhouse, to accomplished surfers who will embark on a Surfaris to discover each day a new surf spot under the guidance of local guides. The bay is the meeting point where the warm Indian Ocean mingles with the cold waters of the Atlantic. creating unique conditions for an incredible diversity of marine life. Dolphins are a daily sighting and whales come to clave in the winter, between July and September, putting on a show with their courtship ritual. Enjoying a stunning location perched on a dune overlooking the Indian Ocean, the Surfhouse is the perfect setting for any surfer. The Aloe framed wooden decks overlooking the surf and the beach provide a perfect spot to check swell conditions, watch the surf or do some whale and dolphin watching. Accommodations range from dorms with bunk beds to en-suite double rooms, all with ocean views. The Surfhouse also features a self catering kitchen, outdoor restaurant and a full licensed bar, all with a truly laid back, surfing atmosphere. 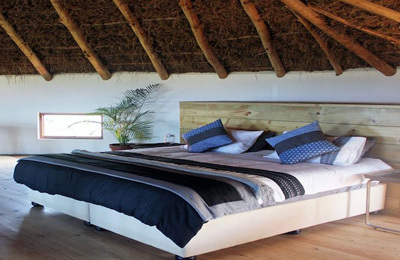 Luxury lodge right on the world class waves of Supertubes, where the pros sleep during the ASP Billabong Pro in July. This superbly positioned lodge offers a unique beach front experience, each suite has a stylish decor, complete with it’s own private balcony with a breathtaking view of waves, dolphins and African sunrises. Nice bistro on the basement floor with full continental breakfast, creative cuisine and shushi-continental food. The experience begins when the jeep comes to pick you up at your accommodation and drives you to the main beach. This beach has small consistent waves which are perfect for learners. A two hours daily lesson in the morning. Free use of the material for practice in the afternoon. The lessons start on the beach where you begin with the safety instructions and warming up. The groups exists out of maximum eight people to secure individual attention. The lessons are designed to be intensive and are of course about having a good time. In no time you will get that stoked feeling you will carry in your memories for a lifetime! For accomplished surfers, surfaris by experienced local guides. Depending on the weather and surf reports, a full licensed instructor will drive you around to the best spots of that moment so good surf is guaranteed. You will be taken to places in Jeffreys Bay, St. Francis, etc., wherever the waves are waiting. You are picked up and dropped off at your accommodation and the equipment is provided, if needed, so all you need to do is relax and enjoy the trip. You can visit a Surf Museum, go shopping and sightseeing in J-Bay. Go Sandboarding, Kite and Windsurfing to make you stay diverse and even more memorable. Hop on Big Game Safari to meet face to face with lions, tigers and other famous South Africa’s animals. Join a Mountain Bike Tour to keep you holiday active and picturesque. Dolphins are a daily sighting and whales come to clave between July and September, putting on a show with their courtship ritual. Simply relax and enjoy endless sandy beaches of South Africa’s coastline. A 10 day Guided Surf Tour of the excellent surf breaks along the picturesque Garden route, including a Game Drive (wildlife safari), Cape Winelands visit, Cape Point and Cape Town city visit. Surf breaks are all of the competent level and easily accessible and user-friendly. Surfing levels catered for is from competent to experience. Surfguide is a certified surf coach so surfing levels will improve throughout the tour. Tour 2: Starts Monday and finishes the following Wednesday. Additional days in Jeffreys Bay are possible in tour 1 & 2. Optional extras: Table Mountain Cable Way, Boulders Beach penguins (Cape Town), Bungy Jumping (Bloukrans Garden Route = world’s highest bungee jump), overnight stay at Game Lodge (=safari) and additional days in Jeffreys Bay or Cape Town. Day 1 – Arrival – Jeffreys Bay Guide collects clients from Port Elizabeth Airport. Transfer to J-Bay, check in at an accommodation. Orientation tour of town and afternoon surf. Sleep J-Bay. Day 2 – Jeffreys Bay Full day surfing at one of the many surf breaks in J-Bay. Surf guide will guide clients to the best break on the day in J-Bay. Sleep J-Bay. Day 5 – Cape St Francis Full day surfing Seal Point and beach break. Tour of St Francis Bay and the unique canal system and Calamari harbour. See the iconic Bruce’s Beauties (if lucky even a surf at this mythique wave). Sleep Seal Point. Day 7 – Mossel Bay Dawn surf Victoria Bay and after breakfast drive 30 min to Mossel Bay. Lunchtime and afternoon surf at Inner Pool or Outers. Visit the Cape St Blaze Cave and the site where the first Europeans landed in Southern Africa. Sleep Mossel Bay. Day 8 – Winelands Early surf Mossell Bay and after breakfast drive 3.5 hours to Franschoek. Enter Franschoek via the spectacular Franschoek pass and enjoy a walk around the historic town. Afternoon visit to winelands and wine tasting. Sleep Winelands. Day 9 – Cape Town After breakfast, drive to Cape Point via Simons Town. Visit Cape Point National Park where the two oceans meet and then drive to the City via the scenic Chapmans Peak drive. Visit city bowl and Waterfront. Sleep Cape Town. Day 1 – Arrival – Cape Town Guide collects clients from the airport; check in at accommodation and after a shower, head into Capetown City and the Waterfront.Sleep Capetown. Day 2 – Cape Point & Wine Lands Breakfast, checkout and then head to Cape Point via Chapmans Peak to view where the Indian and Atlantic Oceans meet. Then on to the Winelands via Simons Town for an afternoon wine tasting. Sleep winelands. Day 3 – Mossel Bay After breakfast, drive to Mossel Bay for lunchtime surf at Inner Pool. Visit the Cape St Blaze Cave and the site where the first Europeans landed in Southern Africa. Sleep Mossel Bay. Day 4 – Vic Bay Early surf at Mossel Bay and after breakfast a 30- minute drive to Victoria Bay. Lunchtime and sunset surf at Victoria Bay. Evening braai.Sleep Victoria Bay. Day 5 – Cape St Francis Dawn surf at Victoria Bay, breakfast and drive via Garden Route to Seal Point. Stop along the way in Knysna, and at the Bloukrans Bungy Bridge. Afternoon session at Seal Point. Dinner St Francis Bay.Sleep St Francis Bay. Day 6 – Cape St Francis Full day surfing Seal Point and beach break. Tour of St Francis Bay and the unique canal system and Calamari harbour. See the iconic Bruce’s Beauties (if lucky even a surf). Day 7 – Jeffreys Bay Morning surf at Seal Point, Breakfast and then off to J-Bay, 30-minute drive. Orientation tour of town and then Surf J-Bay lunchtime and sunset. Sleep J-Bay. Day 8 – Jeffreys Bay Full day surfing at one of the many surf breaks in J-Bay. Surfguide will guide clients to the best break on the day in J-Bay.Sleep J-Bay. Day 9 – Jeffreys Bay Morning surf J-Bay and afternoon Game Drive(=safari) Sleep J-Bay. Jeffreys Bay Jeffreys Bay, or J-Bay as it is affectionately known, is sandwiched between the scenic Garden Route and Sunshine Coast, so called as this region has more sunshine hours than any other in the country. The climate is temperate, dry climate with warm summers (27º C) December-February, and mild winters (19º C) June-August. The closest major airport to Jeffreys Bay, South Africa is Port Elizabeth International Airport (PLZ / FAPE). This airport is in Port Elizabeth, South Africa and is 80 km from the center of Jeffreys Bay. Included in all the packages with surf lessons or surfaris. Clients booking accommodation only will be charged 90 euros (both ways) and 50 euros (one way) for airport pick-ups at Port Elizabeth. EU, US and Commonwealth citizen do not require entry visa. A 90 day tourist visa will be automatically issued on arrival. There are no compulsory vaccinations for South Africa required for travellers from Western Europe to gain entry. However, a Yellow Fever vaccination certificate could be required for travellers coming from some endemic zones in Africa and the Americas. Furthermore, for the short-term traveller the recommended vaccinations for South Africa usually consist of cover against: Tetanus and Diphtheria, Hepatitis A and Typhoid. Free use of the equipment to practise/surf with outside of the lesson/session times. Accommodation in a B&B at one of our partner Guesthouses. All partner Guesthouses are the best in J-Bay and located within walking distance of the surf breaks. African Perfection Guesthouse is our main partner but from time to time, other similar partner guesthouses are used, according to availability. Package includes breakfast and the room serviced on a daily basis. A 10 day Guided Surf Tour of the excellent surf breaks along the picturesque Garden route, including a Game Drive (wildlife safari), Cape Winelands visit, Cape Point and Cape Town city visit. Tour 1 starts on Wednesday and finishes the following Friday & Tour 2 starts Monday and finishes the following Wednesday. Additional days in Jeffreys Bay are possible in tour 1 & 2. Surf breaks are all of competent level and easily accessible and user-friendly. Surfing levels catered for is from competent to experience. Surfguide is a certified surf coach so surfing levels will improve throughout the tour. The tour will have to start on specific days: Tour 1 – arriving in Port Elizabeth on Wednesday, leaving from Cape Town the following Friday. Tour2 – arriving Cape Town on Monday and leaving from Port Elizabeth the following Wednesday. That is to cut down on weekends at surf breaks. 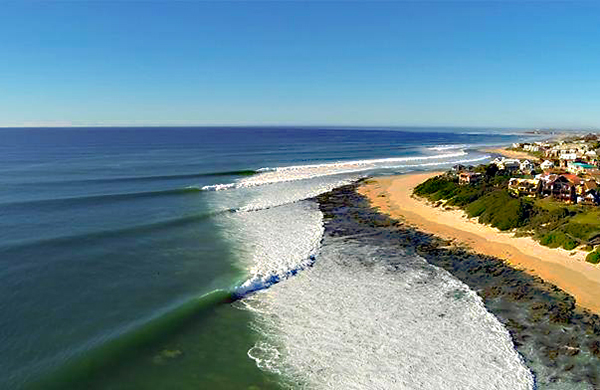 Jeffreys Bay has nine different surf breaks that suit all levels of surfing. With Dolphin Beach (perfect safe Blue Flag learn to surf beach), Kitchen Windows for intermediate gentle surfing, The Point for super fun hotdog waves, Magnatubes & Albatross for down the line surfing and the ultimate World Class Supertubes, J-Bay has waves for all levels of surfers to enjoy. Jeffreys Bay has a Mediterranean climate with mild winters and enjoyable summers. The sea temperature does not change to drastic either, with cool water in winter and warm water in summer. All full packages include a day tour to the epic waves of “Endless Summer” and this is fully included in the price. Clients who are competent surfers will go for a daily two-hour guided surf session at the best break on the day. The guide, who will surf with them, will collect and return clients to their accommodation. For learn to surf and intermediate lessons,the surf school is located right at Dolphin Beach, the perfect learn to surf beach and Kitchen Windows break is ideal for intermediate lessons. Children under 4 years old come free (accommodation only). Accommodation at our main partners are subject to availability. If these accommodation establishments are fully booked over the requested dates, we do use similar partner Guesthouses/Surf Lodges for accommodation. "It was very nice. It's an awesome place. Etienne, Tim and Jerry are very cool. The hostel Crystal Cove is also a great place. Thanks again Steph and Amelie"
"If you like to surf, go here." Thanks Seung!It was great having you here bru.Sea ya soon again. "Great waves, great accomodation, great food, great people, great!" Tx Lars,It was a pleasure having you here with us in magic Jbay;) Cya again. "Absolutely stunning! Relaxing, serene and unbeatable views. Friendly and caring staff, great attention to detail and a delicious breakfast. Comfortable and quiet rooms despite the guest house being full. We are definitely coming back!" "If you like to surf J Bay is the place to be! We spent 2 days at here. Super friendly staff and very nice rooms! If you walk throuh the lovely garden your reach the beach in just a few seconds. We enjoyed every second." "Beautiful guesthouse, the rooms are neat and clean. The guest house is close to the beach in a lovely garden. The staff are very professional and willing to assist with any requests. Delicious breakfast. A special thank you to our host!" Super, in so many ways! "We stayed for one night . The location was excellent,the rear gardens backed onto the beach. local shops were only 5 minutes walk. Our room overlooked the rear gardens and the sea view was a bonus. The room was large and clean, had a balcony , encompassing a table and chairs. Tea making facilities , security box"
"Visited during the Jbay Open. Lovely from start to finish. Laid back, relaxed, yet professional and highly recommend for holiday goers looking for place to stay on the beachfront when visiting the beautiful Jeffreys Bay." 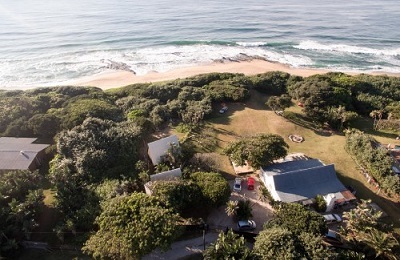 "Awesome views of the sea and the surf, spacious and clean room, great self catering facilities too. We love it here and could have stayed for many more days. Had a very fast laundry service too, and a breakfast selection to die for. All staff were very attentive"
"The best place we stayed at on our 5 week trip of South Africa. We booked the 3 bedroomed apartment which was so clean, stylish and comfortable I did not want to leave the place. It was a few steps to the beach as well. Breakfast can be had at the guest house and there is even a nice cafe over the road which made good coffee. We also had an equipped kitchen to make our own meals. To visit Jeffreys Bay you need a car and then everything is close by. 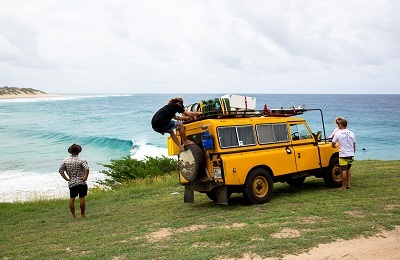 Then who wants to drive in a place like this you surf or relax once you check in! Restaurants for dinner can be reached by foot. Stayed in December. Traveled with family."